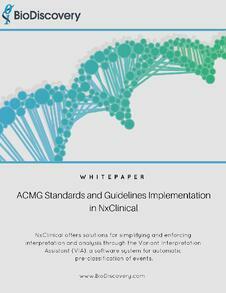 https://cdn2.hubspot.net/hubfs/644585/bio-whitepapers/ACMG%20Standards%20and%20Guidelines%20Implementation%20in%20NxClinical_Whitepaper%20Cover%20Page.jpg Download our new whitepaper on ACMG Standards and Guidelines Implementation in NxClinical. The American College of Medical Genetics (ACMG) has set standards and guidelines for the interpretation and reporting of copy number events in a clinical setting. Enforcement of these rules requires comparison to both previous in-house sample archives and external sample databases, as well as set reporting standards. NxClinical offers solutions for simplifying and enforcing interpretation and analysis through the Variant Interpretation Assistant (VIA), a software system for automatic pre-classification of events. Following independent review of each sample by trained personnel, NxClinical allows for seamless reporting of final results in accordance to ACMG guidelines.